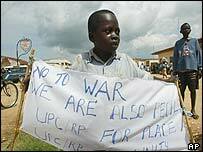 The UN Security Council has granted US peacekeepers another year of immunity from prosecution by the International Criminal Court (ICC) by 12 votes to none. But the extension of immunity was given grudgingly, as almost every speaker in the preceding debate highlighted the unlikelihood of US peacekeepers ever being in a position where they are prosecuted by the court. And three of the 15 Security Council members - France, Germany and Syria - demonstrated their disapproval by abstaining. Earlier, UN Secretary General Kofi Annan warned that the legitimacy of peacekeepers would be undermined by recurrent extensions to their immunity from the jurisdiction of the ICC - the world's first war crimes court. The US put forward the resolution, which extends the immunity of states which have not ratified the ICC's founding statute from its jurisdiction for a second year from 1 July. It is currently drawing up agreements with individual governments that bar them from surrendering American nationals to the court, and has signed nearly 40 such agreements so far. The deputy US ambassador to the UN, James Cunningham, welcomed the approval of his resolution but added, "like any compromise, [it] does not address all our concerns". He rejected the assertion of many speakers in the open debate which had preceded the vote that the US was trying to put itself above the law, declaring "the ICC is not the law" and declaring the court "a fatally flawed institution". Despite initially signing up to the ICC treaty under Bill Clinton, the US withdrew its signature in 2002, arguing the court could be used to pursue politically motivated prosecutions. But participants in the debate repeatedly pointed out that the court can only proceed with a prosecution when the alleged crime was committed on the territory of a party to the statute, or where the accused is the citizen of such a state. They also pointed that that the court would only prosecute a case where a country was unwilling or unable to do so in its own national courts. "The Security Council should not be rewriting treaties that were negotiated by the entire international community," said Jordanian Ambassador Prince Zeid Ra'ad Zeid al-Hussein. The prince is chairman of the Assembly of States Parties to the Rome Statute which founded the ICC and presided over the election of the court's 18 judges in March and April this year. Germany, also a principal proponent of the court, first conceived during the Nuremberg trials of Nazi war criminals, said abstaining was "a matter of principle". Even the UK indicated it had differences with one of its closest allies over the issue. "Whilst we understand US concerns about the International Criminal Court, we do not share them," said UK Ambassador Sir Jeremy Greenstock. Earlier, Mr Annan said the council would undermine its own authority as well as that of the ICC if the exemption became "an annual routine". He said no soldier serving under the UN blue flag had ever been accused of an offence "anywhere near the kind of crimes that fall under the jurisdiction of the ICC". 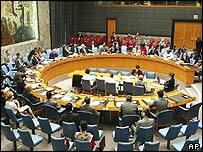 Despite the vote in favour of the US resolution, the Security Council's vocal misgivings about such a resolution threaten to reopen wounds still fresh from the council's feuds over Iraq. Transatlantic tensions have been rekindled. It emerged recently that the US complained bitterly about an EU effort to prevent prospective EU member states giving Washington blanket immunity for American nationals from prosecution. On Thursday, one such prospective EU member, Croatia, announced it would not sign an immunity deal proposed by the US "because of legal and political obstacles", deputy foreign minister Ivan Simonovic told journalists.